Some of you astute followers of this blog have realized that there are far less posts in recent weeks. Well, we can all blame twitter for this. Many of our would-be posts have been shrunk down to bitesized, little treats of information and interactivity. The truth is, our adoption of Twitter has allowed us to make far more posts per day and interact with many more of you than ever before. Yes. We like Twitter, but we also understand that blogs still have their place and that many prefer to "follow" us via this channel. Your concerns have been duly noted. Not only that, but starting today, we take action! What you will find below is Issue #1 of, what we have dubbed, TWEEK. 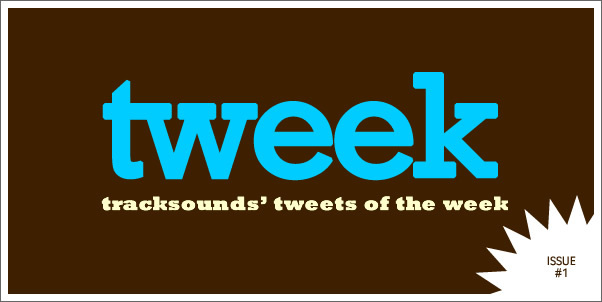 It's simply a digest of our "best" tweets of the week. Of course, "best" is a somewhat relative term, so to clarify...we simply mean the tweets that would most likely interest you faithful, soundtrack hounds. Of course, to get the full, live, interactive tweet experience, we suggest you just bite the virtual bullet and simply follow us on twitter. It's really quite painless. In the meantime, here is our first weekly issue of Tweek! Composer Geoff Zanelli's new official website http://bit.ly/1cDz0v Stumbled on it today. Not a ton of content just yet. Ever get the feeling while listening to Phillip Glass that something tragic is about to happen? Thanks for the link to the Invincible Tiger soundtrack. Who wrote the score? It's pretty good stuff.